The Yarmukian was recognized as a cultural entity in the early 1950s(Stekelis 1950/51, 1972) and additional layers were excavated during the 1950s and 1960s (Perrot 1968; Kaplan 1958, 1965, 1978), and during the last decade both in Israel (Garfinkel 1993;Gopher 1996;Gopher and Tsuk 1990) and in Jordan (Kafafi 1985,1986, 1988;Muheisen et al. 1988; Simmons et al. 1989; Rollefson et al. 1992). Recent summaries make it clear that the Yarmukian is a very distinct entity restricted to a specific area of ca. 10,000 km2 of the southern Levant and dated to the last two thirds of the sixth millennium bc (see Garfinkel 1992, 1993;Gopher 1995; Gopher and Gophna 1993;Kafafi 1987, 1993). (Simmons et al. 1988; Kohler-Rollefson et al. 1988). Architecture includes both circular and rectilinear buildings and the few burials exposed in Yarmukian levels include both adults and children. It was recently suggested that assemblages similar to Garstang's (1935, 1936) stratum IX and Kenyon's PNA (Kenyon 1981) deserve a place as an independent cultural entity in the Pottery Neolithic sequence of our region named the "Lodian." 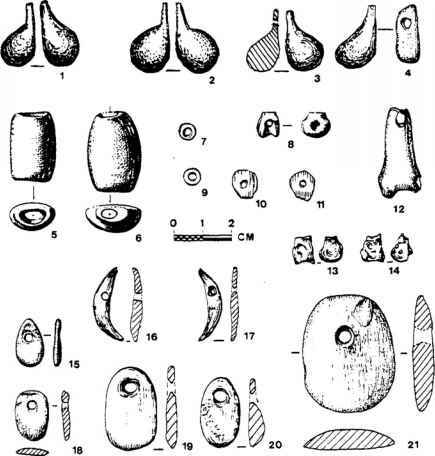 This entity with its distinct pottery and lithic assemblages postdates the "normativeYarmukian" and predates the Wadi Raba culture (Blockman 1997; Gopher and Gophna 1993). This entity, however, has very little imagery, and it is unclear how this assembage should be incorporated into regional reconstructions.